Weekly Update from Your Alderman: We celebrated lots of great events last week and are looking forward to the start of the Argyle Streetscape project and the return of the Argyle Night Market next week. Have a safe and Happy 4th of July! Last weekend we celebrated so many great events in our neighborhood and elsewhere in the City. They included the dedication of the beautiful mural at the Edgewater Whole Foods store (see photo above) that was created by teens in the After School Matters Green Star Bricolage Program. This is just one example of the colorful artwork projects that are helping brighten and enliven our community. We also held our first neighborhood One Long Table event of the season last Saturday. 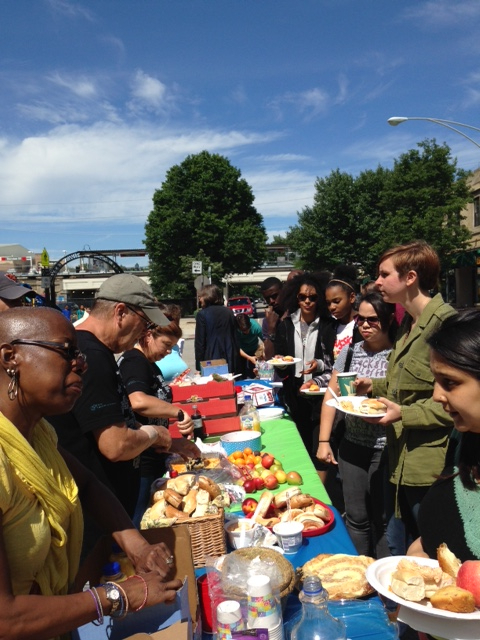 More than 100 neighbors came out to enjoy a delicious brunch and great conversation along Thorndale Avenue. We'll be holding more of these events this summer as we work together to build community and improve safety. 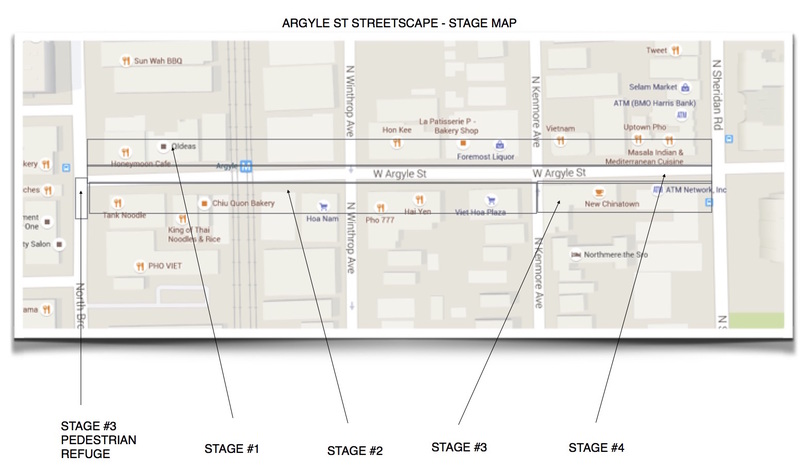 The Argyle Streetscape project begins Monday July 6. We have been working on this plan, the first Shared Street Project in the City of Chicago, for a number of years. We will be working diligently with businesses and residents in the Argyle area throughout the construction, which will take about a year to complete. Please be sure to support all the wonderful businesses along Argyle, Broadway and Sheridan during the work. 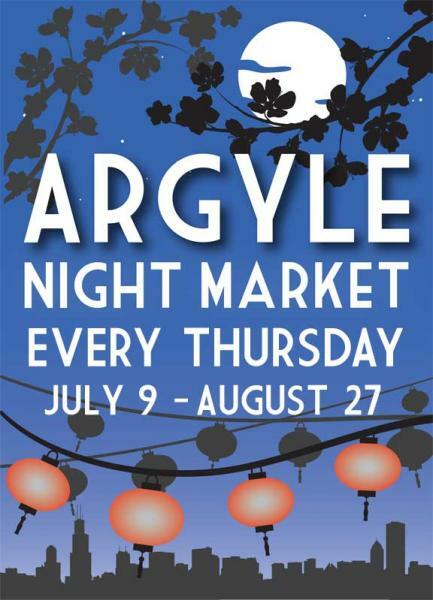 And don't forget to come out each Thursday evening starting next week (July 9) for the Argyle Night Market, which will be held on Argyle between Kenmore and Sheridan. More details on the Streetscape project and the market can be found below. The 48th Ward Film Fest kicks off next Tuesday with the screening of Alexander and the Terrible, Horrible, No Good, Very Bad Day at the Swift School playground, 5900 N Winthrop Ave. Other upcoming movies in the series can be found here. Once again this year, the Saddle & Cycle Club at Foster Avenue and Sheridan Road will be putting on its fabulous 4th of July fireworks show at dusk on Saturday. Although Saddle & Cycle is a private club, the fireworks will be visible from many places in the ward, including Osterman Beach, the Meadows and Margate Park. 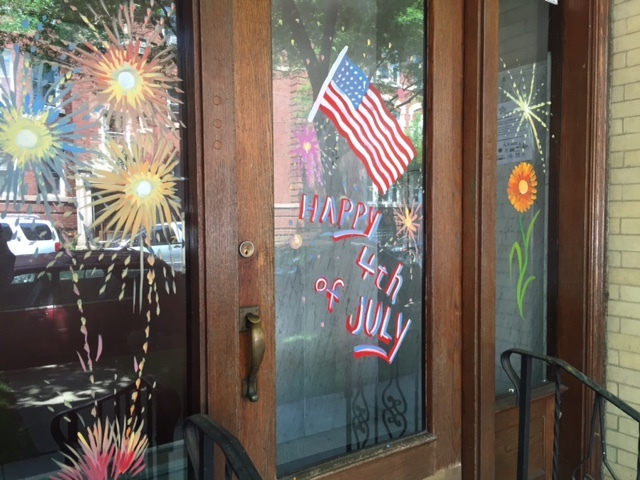 Here's wishing you a wonderful and safe July 4th holiday weekend! Traffic will be one-way only going east 24/7 throughout the project. Westbound traffic will have detours posted throughout the community. Parking will remain on the south side of street, where possible. All staging of materials will be in the work zone. Stage 1 of the project will begin on the north side of Argyle, starting at Broadway and working east. This project will proceed in phases, beginning with the removal of all sidewalks, curbs and gutters. Stage 1 is from July 6-October 6, 2015; Broadway to Sheridan, north side. Stage 2 is from October 6-November 20, 2015; Broadway to Kenmore, south side. Stage 3/4 (Spring 2016): Kenmore to Sheridan and Argyle Street. There will be access to the CTA station and all businesses throughout the project with some challenges when the contractors are in front of each individual business. All pedestrians will be encouraged to use the south side of the street. There will be no work done on Saturdays and Sundays. The contractor for the project, Speedy Gonzales, will have an onsite office at Argyle, exact location to be announced soon. They will be available to the community to answer any questions and will hold weekly meetings at their office throughout the project. You also may contact the 48th Ward office at 773-784-5277 or argyle@48thward.org. Please continue to support our Argyle community during this improvement of infrastructure by shopping and eating at our local businesses. Vendors will include Ba Le Sandwich Shop, Phoenix Bean, Yoberri Gourmet, Empanadas Argentina, Uptown Brownies, Sitka Salmon Shares, Carol Akiyama jewelry and scarves and more. Also, the first summer Play Streets event will be going on that evening from 4:30-7:30, with a wide array of fun activities. 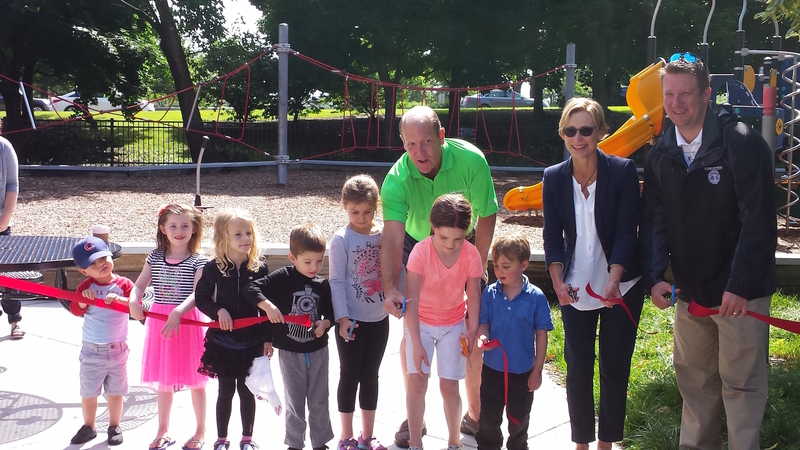 Last Saturday I was joined by Chicago First Lady Amy Rule and Chicago Park District COO Patrick Levar at the official opening of our community's beautiful new park just east of Sheridan Road between Bryn Mawr and Hollywood Avenues. The playground includes slides, swings, climbing structures and a water feature. Please come and check it out this weekend! Children under the age of 15 suffered 45 percent of all injuries from fireworks. Seventy-two percent of these injuries are to males of all ages. These injuries include trauma to the eyes, fingers and face. Firecrackers cause the greatest number of injuries, followed by bottle rockets and sparklers. Parents can be criminally responsible for child endangerment if they permit their children to use fireworks. There are several officially sanctioned fireworks displays throughout the city for families to enjoy safely. On Saturday at dusk, Saddle & Cycle Club's fireworks show will be visible from many spots along the lakefront in the 48th Ward, and Navy Pier will be holding its fireworks display . If you see or hear anything suspicious this weekend, please call 911. If you would like to share this information with our office, contact 48th Ward Public Safety Liaison Marko Zaric at 773-784-5277 or Marko@48thward.org. 48th Ward Summer Nights is a series of events throughout Edgewater and Uptown promoting a safe, positive and fun summer. All of the events are free and open to the public. The goals of the these events are to build community, meet new neighbors and improve safety. Please join us! Many Andersonville and Edgewater shops, restaurants, services and performing arts venues were recently named to the Chicago Reader’s Best of Chicago list. Here are the winners and runners-up from our community. Best Wine Shop: Independent Spirits, Inc.
Best Liquor Store runner-up: Independent Spirits, Inc.
Best Coffee Shop: Metropolis Coffee Co.
Best Jazz Musician: Lili K.
Farmers Market Open on the 4th! 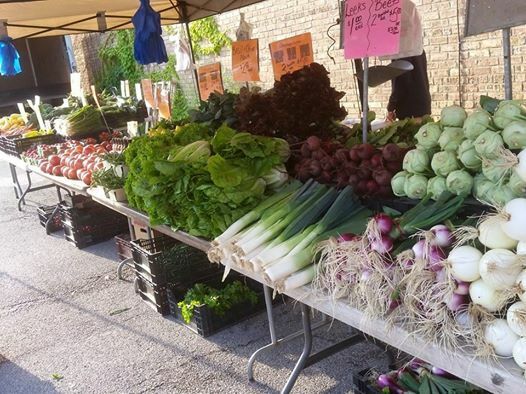 The Edgewater Farmers Market takes place from 8 am-1 pm every Saturday through October 17. The market, which is located in the Broadway Armory larking lot, offers fresh local produce, baked goods, cheeses, coffee and other specialties. There are still spots open in the free Alternatives Summer Camp Program for youngsters 13-15 years old. The program, already underway, runs from 10 am-4 pm Monday-Friday until August 28. If interested, please call 773-506-7474 and ask to speak with Valarie Ridley or Jake Frelick. Rickover Naval Academy will offer beginning archery lessons every Tuesday in July. Youth who have completed grades 6 through 11 can sign up for lessons in proper shooting technique, range safety and team-building skills. The lessons cost $80. Join Dream Big Performing Arts in Andersonville for week-long drama camps. Sign up on a week-to-week basis, with camp experiences tailored to a different theme every week. Each camp costs $225. The award-winning Senn Arts program at Senn High School will be holding summer camp classes to rising 6th, 7th and 8th grade students ages 11-14. Classes will offer confidence-building, arts training and performance opportunities. Campers may register on a weekly basis for $75 per week, or for the entire four weeks for $300. Raven Theatre is offering five summer camp sessions focusing on the themes of Adventure, Fantasy and Sci-Fi. 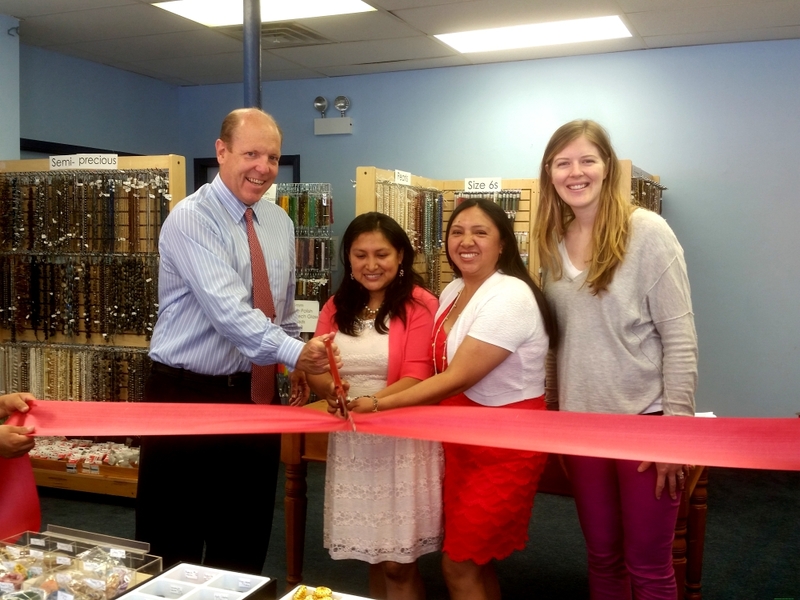 On Wednesday, I was delighted to cut the ribbon celebrating the opening of a new Edgewater business, AVP Jewelry and Beads, within the Blue Buddha Boutique at 1127 W. Granville Ave. AVP is a bead and jewelry supply shop that also provides a variety of jewelry-making classes for kids and adults, along with custom jewelry repair. Ana Pizzaro, owner of AVP Jewelry and Beads, says of her partnership with Blue Buddha Boutique: “I think they are my family. When you visit us, you will feel like you are at home because of our family environment!" Beginning next Tuesday, July 7, the 48th Ward Office will stay open until 7 pm on Tuesdays to address constituent needs. (Regular office hours are 9 am-5 pm Monday-Friday.) Summer hours will run through August 18. Street sweeping season is in full swing. You can check your street's cleaning schedule by clicking here. 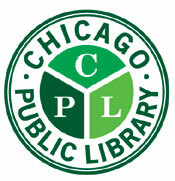 The Chicago Public Library's Summer Learning Challenge is not only for children, but also for teens. The challenge for teens is to read anything they want for 600 minutes, to discover six new resources, facts or events, and to create six original pieces showcasing their newfound knowledge, as well as to share what they've read, discovered and created at the library or online via social media (#cpldefygravity). Perks for teen participants include weekly raffle giveaways, and for those who complete the challenge, a raffle for a solar-powered sound system as well as an invitation to our special end-of-summer teen celebration. We are so grateful to UKANDU Ministry for selecting Care for Real as one of its charitable partners this year. A team of volunteers helped to repaint our facility, wax floors and give Care for Real a beautiful facelift. If you would like to stop by and experience Care for Real on a busy pantry day – and check out the new look – please email Lyle at lyle@careforreal.org. The Andersonville museum, 5211 N. Clark St., offers learning experiences for people of all ages. at the Loyola Avenue CTA Red Line Stop. "Get Fit for Life" at Margate Park, 4921 N. Marine Dr., this summer with a full roster of fitness classes. Starts at 1420 W. Glenlake Ave.
St. Andrew Greek Orthodox Church, 5649 N. Sheridan Rd. There will be Greek food, Grecian dancers and children's activities. Berger Park, 6205 N. Sheridan Rd. Bring your dog for a small dog wash and to learn about retired racing greyhounds. Dog washes range from $10- $20. The Little Free Library Community Build Day has been rescheduled for Saturday July 18. Details to follow. Please follow Edgewater Reads on Facebook here or contact Karen Dreyfuss with any questions at Karen@48thward.org. by 5 pm on Wednesdays to be included in the next Friday's newsletter. 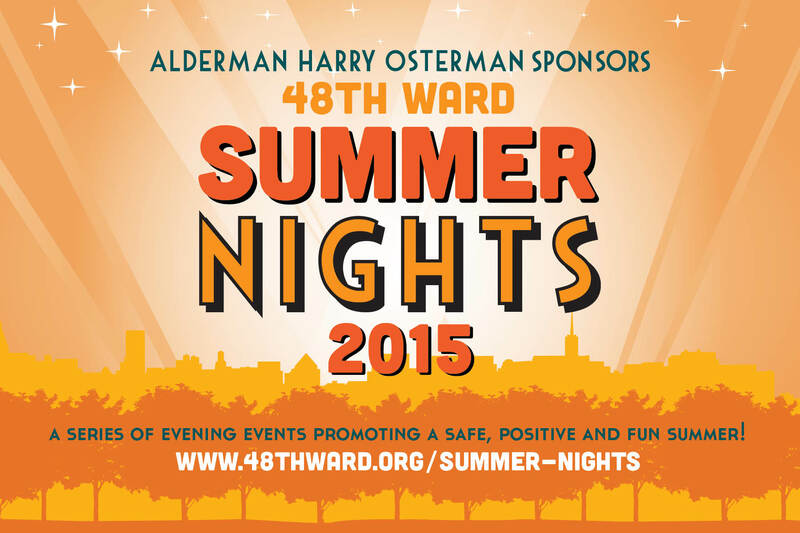 Copyright © 2015 Harry Osterman - 48th Ward Alderman, All rights reserved.